Sunday September 21 Cold & unpleasant, tho' no storm & sun shone out in P.M. little. Find self feeling rather weak & tired this morn, & didn't get out to church, but set about writing to "Aunt Lemina" finishing last of P.M. with regular course of interruptions, of course, Ellery at home most of day getting all sleep he can, Mr & Mrs May up to their garden, & came in for short time. 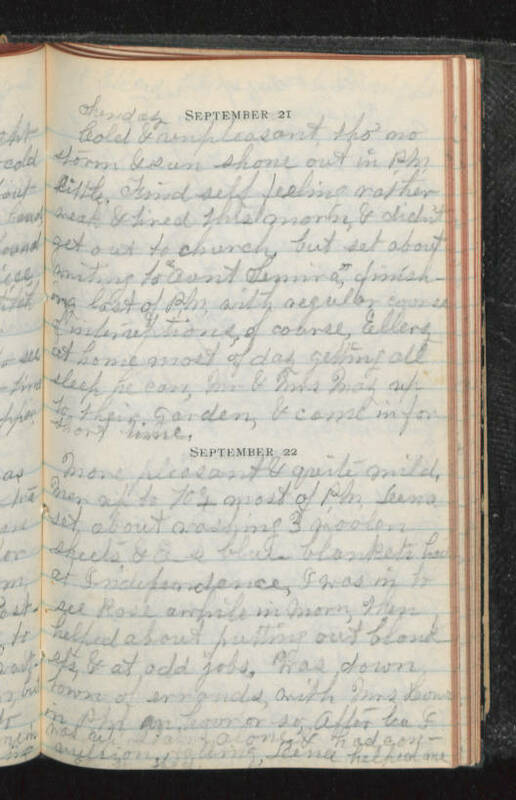 September 22 More pleasant & quite mild Mer up to 70°+ most of P.M. Lena set about washing 3 woolen sheets & E_s blue blankets had at Independence, I was in to see Rose awhile in morn, then helped about putting out blankets & at odd jobs. Was down town of errands with Mrs Howe in P.M. an hour or so, after tea I was up stairs alone & had convulsion, falling, Lena helped me.